Download our new Tradecards Global App on iOS and Android to read the latest issue! Dear Readers, Happy 2018! 2017 seen Lighting Today attending more events than the previous years, being poised at the forefront of the ever-changing bathroom and kitchen landscape in Singapore. We share some of these exciting new brands, products and innovations in this issue! 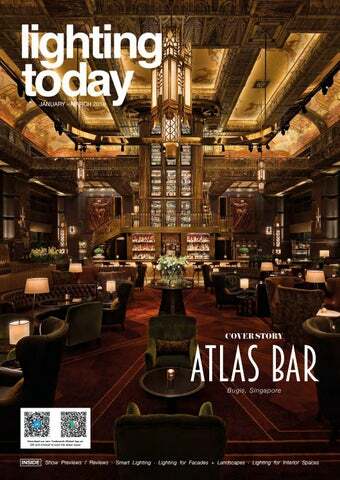 Our cover story features a celestial rejuvenation within Singapore’s famous ‘Gotham Building’. The Divine Bar, located on the ground floor of the iconic Park View Square Building, had been a landmark destination in Singapore for more than 15 years. The double void Wine Tower that featured an “angel” hoisted up to pick up a desired bottle from the tower. However, its lavish interiors were starting to look tired and the owners decided to invigorate some new life in the bar with a challenging renovation. Helmed by the gifted Klaasen Lighting, it is a project not to be missed. Our facades segment fawns over Moment Factory’s most ambitious project, held within Montreal’s revered landmark Notre-Dame Basilica. This 45-minute immersive sound, light and video projectionmapping experience begins with a self-led tour that lets visitors explore the Basilica, discovering fresh perspectives on the cathedral’s sublime artworks as these are accentuated by multimedia-enhanced installations. The pictures are gorgeous to the last wink. Have something lighting related to share? Send it in! We welcome submissions and would be happy to feature pieces from loyal readers. To end off, we wish you a happy start to 2018 – to an amazing year ahead! IS THE LIGHTING DESIGN PROFESSION UNDER THREAT? A look at how the world is changing! Then there is Light as a Service…in this model the responsibilities are transferred back to the lighting manufacturer together with their financiers and installers. In a lighting service model, a client does not have any upfront capital expenditure, but just a monthly fee that guarantees him an agreed lighting quality performance and energy consumption over a certain length of time, in other words his monthly costs are fixed. The lighting manufacturer’s team providing this service is responsible for the design, installation, operation and maintenance and has a big interest in making sure that the lighting performs well and consistently to minimize expenses in operation, management and maintenance. This should theoretically drive innovation of recyclable lighting systems and move the lighting industry from a waste economy (light fittings today are designed to fail!) to a circular economy where a light fitting produce optimal performances and can be reconditioned, reconfigured or recycled. Is there a role for the lighting designer in this model? I believe there is one and a very important one. Today we are the independent professional who assures that the integrity of the design and the clients requirements are upheld. That role can be continued in a service model. The lighting designer will still need to consult and cooperate with one or more lighting manufacturers to establish a good lighting design practice, in this case as part of the consortium that is to supply, install, operate and maintain the lighting. But it will have a watchdog function at the same time, as the service provider’s team’s conscience or quality controller... As we move into this new year and the role of the lighting designer within this changing world is gradually taking further shape, we need to be pro-active, consult and cooperate to make sure the lighting design profession remains relevant! 20° or 40° beam angle options Glare-free Low voltage 50,000 hour lifetime at 100% (LM80) Fully dimmable, 1-100% Three color temperature options, 2700K, 3000K and 4000K - - 80 or 90 CRI - - 5 fixtures per 100W transformer - - High performance LED light source MINUS is available immediately. More information is available on the Apure website at www.apure-system.com/ minus. About Apure Headquartered in Miami, Florida, Apure is a high-end lighting manufacturer specializing in developing innovative and state of the art fixtures to complement interior and exterior design. Engineered and manufactured in Germany, Apure’s main objective is to produce high-performance products with the ability for customer personalization as standard to make lighting fixtures part of the design’s entire esthetic. Apure lighting solutions can be found in commercial and residential environments where architectural design is important. The company was recognized with a Red Dot award, the international distinction for high design quality, in 2016 for its Opus product and with the European Design Award in 2017 for the MINUS. For more information, visit www.apure-system.com. .luxâ&#x20AC;&#x2122;s new LED modular lighting system is the work of designer T im Brauns, who has become a regular collaborator of the Basque manufacturer. It is a suspension system called KUP that can be used to create multiple modular compositions and adapted to all types of home and architectural settings. KUP is marketed in two standard formats: KUP 1 and KUP 2. Each lamp consists of five adjustable LED light bodies offering direct light. The structure of the KUP lamp has a black finish that gives it a restrained, industrial look. The LED light bodies are available in different finishes: black, and luxurious gold and copper finishes. In every version, the diffusers are made from white opal matte acrylic. One of the main advantages of KUP is that additional modules can be used to increase its size to adapt it to the surface area and space. The modules can be plugged into any end cap on the standard lamps and consist of a body and two heads. For more information, visit www.grupoblux.com. of light distributions. In some places, Iarussi deployed Quintessence and Skim downlights, Optec and Pantrac spotlights as well as Lightscan outdoor projectors. Individual Lighting, Differentiated By Context Director Monsignor T imothy Verdon explains the significance of light in his museum this way: “Lighting is a major component to the overall experience of artwork in any museum. But when your collection consists almost entirely of sculptures, light management is absolutely critical to the presentation. Because whilst paintings invariably require uniform, glare-free illumination, the three dimensions and shadow zones of statues and reliefs call for differentiated lighting influenced by the periods in which they were created, their artistic style and their original context.” The wisdom of his point is brought home particularly well by the centrepiece of the presentation, the breathtaking “Salone del Paradiso” (Hall of Paradise), which extends across three floors and is illuminated with light coming from the skylights. The spectacular dimensions of this lightinfused interior evoke an outdoor environment that makes it ideal for the presentation of artwork originally created for the exterior, such as the celebrated bronze doors of the Baptistry, designed by Lorenzo Ghiberti in the first half of the 15th century. However, the hall is dominated by a spectacular, fullscale model of the Cathedral’s medieval façade, which was never completed and ultimately dismantled. Faithfully reconstructed, many of the preserved statues and reliefs were integrated into the model and returned, as it were, to their original location. The diffused natural light in this space is complemented by accent light from powerful Parscan projectors focused, from different angles, onto the object and the individual sculptures. For more information, visit www.erco.com. on 15 January 2017. Here too, the jury chose a winner from among the nominees. “We have a wide spread of contributions for this prize from all over the world and there is no difference between one country and the other. These are people who are truly dedicated to what they are doing and they do it in such a fabulous, non-egoistic manner, with the aim of trying to create better lives for many other people,” said Jury Chairman Kjetil Trædal Thorsen from Snøhetta Architects. The first prize in each of the three categories carries a purse of EUR 50,000. An additional purse of EUR 15,000 will be distributed for the Young Professional. This raises the total purse from EUR 150,000 to EUR 165,000. For more information, visit www.zumtobel-group-award. com/nominees.html. THORN LIGHTING AWARDED SINGAPORE’S THOMSON-EAST COAST LINE LIGHTING PROJECT Mass Rapid Transit (MRT) line. This completely underground and driverless line will be Singapore’s third longest MRT line. The new line will span 43km with 31 stations. When completed, TEL will connect commuters living in the eastern parts of Singapore who are not currently served by the rail network. For this project, Thorn will be providing luminaries of the highest standards. Based on the stringent criteria required by the client, over 100.000 Thorn LED luminaires will be installed in the TEL tunnels and maintenance areas, including AreaPak Pro, Chalice, CiviTEQ, Formula LED, GTLED, HiPak and PopPack LED. Matthew Boucher, SVP Sales, Zumtobel Group Asia Pacific comments, “Having the privilege to be selected as the lighting partner for this critical infrastructure project in Singapore makes our team very proud, we look forward to delivering a world class project for the Land Transport Authority and actively contributing to Singapore’s infrastructure projects.” Work is set to commence in October 2017 with the line due to open in stages from 2019. When fully operational it is initially expected to serve approximately 500,000 commuters daily, rising to one million commuters in the future. For more information, visit www.thornlighting.com. winner won the grand prize of a trip to Lapland, Finland. Food aficionados headed to SAVOUR for celebrity chef creations priced from $6 from award-winning restaurants and dine alfresco under the twinkling lights or in airconditioned Snow Globes, a first at Christmas Wonderland. Diners also enjoyed the Finest W ine Market where over 130 types of wines from around the world awaits. A treasure trove of activities, treats and gifting gems were unwrapped at the Supertree Grove. Free Festive Workshops and more retail options were available for the first time at the all-new Mistletoe Alley, whilst the European-style Festive Market offered unique ready-made gifts and a wide variety of culinary offerings. Visitors enjoyed Christmas carols and live performances at the magical Cassa Armonica gazebo and sang along to popular yuletide tunes with the Garden Rhapsody: Christmas Edition light show. Traditional carnival games and kiddie rides, including the classic Carousel and swinging chairs, were popular at the Fairground. Admission to Christmas Wonderland started from S$4, providing access to a myriad of attractions across the 57,000sqm fairground. Additional charges for some attractions within the event grounds applied. For more information, visit www.christmaswonderland.sg. ased on the now iconic Paramount Pictures Film, Flashdance – The Musical tells the story of 18 yearold Alex who dreams of attending the prestigious Shipley Dance Academy and becoming a professional dancer. Yet when a romance complicates her ambitions, she harnesses this to drive her dream. The show is currently on a tour across the UK and White Light has provided the lighting equipment. Flashdance – The Musical is being produced by the awardwinning Selladoor Productions and features a lighting design by Mark Howland. He comments: “Having never actually seen the film, this allowed me to approach the piece with a completely fresh perspective as though it were a new piece. The show is very rooted within 80s music so I was keen to push some of the bold 80s colours which are largely associated with the music videos and concerts of that time. We also keep a lot of the lighting rig in view”. By having the rig in constant view, this meant that it became a part of the aesthetic. Mark comments: “The boom towers worked well with the par cans making a strong feature at the side of the stage. These dance towers provided a powerful crosslight as well as being a strong visual feature in which we could frame the rest of the scenic design!”. Alongside his artistic approach, Mark was also conscious of ensuring that the rig he designed was tourable. He comments: “The rig has to remain manageable due to an extremely busy touring schedule. As a result, a number of moving lights were used to fulfil a range of roles. All of the overheads are moving lights. We used a number of Martin MAC IIIs as their punch and wide zoom range gave me strong gobo and toplight options. The fact that they’re so powerful also meant that we didn’t require a large number of fixtures. He adds: “We also draw quite heavily on the Martin MAC 700 range which are small enough to fit in the dance towers yet also quite powerful and work well for general colour washes as well as specials”. Mark also utilised the Chroma-Q Color Force LED Battens, ADB Fresnels and Look Solutions Unique 2.1 Haze Machines. The show is currently at the Blackpool Opera House and will tour the rest of the UK until August 2018. Mark adds: “The beauty of lighting a musical is the variety of different aesthetics that you can apply across one show. Whilst there is always a need to adhere to an overall design style that works with the whole team, there is often such a variety of styles and emotions within the songs that can really push the strong and varied choices in the way each one is lit – something I was able to achieve with Flashdance – The Musical”. For more information, visit www.whitelight.ltd.uk. fter a decade during which six PLDC events were held in different European cities, the organisers are looking to stage a PLDC in another part of the world. End of October 2018, the largest convention worldwide for lighting design is expected to take place in the fast-developing region of Asia –and the first location outside Europe where PLDC will be held in Singapore at the iconic Marina Bay Sands. The motto for PLDC 2018 will be “Move it” to underline the organisers intent to move the spirit of PLDC to other parts of the world. The organisers have decided to stage PLDC on an annual basis, continuing in Europe with a large-scale event every two years, but moving to Asia or North America in the years between. In 2019, PLDC will be in Europe again. In 2020, PLDC will take place in New York City/US. “We decided on Asia because we see a strong and growing interest for good quality lighting in this region. Staging this event in Asia can boost the market for the lighting design profession”, Chair of the Convention Joachim Ritter stated. “There is also a lot of inspiration that the rest of the world can gain from Asia”. In Paris, PLDC registered altogether more than 2160 attendees from more than 72 countries. 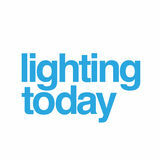 PLDC is known as the Thought Leadership Event for the lighting design community. More than, 19 international associations, 40 Universities, 5 educational Institutes. 24 magazines and online platforms, 7 partner events, 64 sponsoring partners, 13 additional exhibitors took part. Focusing on the key issues of the ‘smar tification of ever yday life’ and ‘aesthetics and well-being in harmony ’, the industr y is preparing to present intelligent and networked solutions, future -oriented technologies and current design trends, which increase not only economic efficiency of buildings but also the comfor t and safety and security of the users, at the world’s biggest trade fair for lighting and building-ser vices technology. As a fair of innovations, Light + Building brings together all power- controlled building-ser vices systems and promotes integrated building planning with a product spectrum unrivalled in both horizontal and ver tical terms. the sector ”, says Wolfgang Marzin, President and Chief Executive O fficer (CEO) of Messe Frankfur t. One of the focal-point themes of the coming fair will be safety and security technology. The combination of different systems, such as video monitoring and access control, their interconnection and integration in building automation are impor tant aspects of interest to both the industr y and users. Thus, the fields of house and building automation and power-controlled safety and security technology will be concentrated together for the first time in Hall 9.1 at Light + Building 2018 to create a focal point – a centre for integrated buildingser vices technology – offering visitors a complete over view of the entire spectrum of house and building automation, as well as electric safety and security technology. Enriching the new location will be a special show entitled ‘SECURE! Connected Security in Buildings’ and the Intersec Forum, which will be held concurrently with the fair on four days from 19 to 22 March 2018. In addition to the concentrated presentation in Hall 9.1, leading manufacturers will present innovations from the world of safety and security technology in other halls of Frankfur t Fair and Exhibition Centre. And, thanks to a brochure entitled ‘Guide to Safety and Security Technology ’, visitors will be able to obtain a quick over view of the complete spectrum to be seen at the fair. The ‘SECURE! Connected Security in Buildings’ special show is designed to give visitors insights into how innovative technical solutions can make a building more economically efficient and take account of the individual users’ needs. In distinction to the exhibitors’ presentations, the special show will take three specific applications (hotel – office – industr y) and blend all aspects from the point of view of security and user inter faces. Aesthetics And Well-Being In Harmony A focal point in the Lighting product segment at Light + Building 2018 will be the presentation of the latest design trends in the lighting market and the exhibitors’ high level of design exper tise. Digitalisation has paved the way for a new dimension of luminaire design, and lighting-technology innovations are shifting the spotlight to people and their personal needs, as shown by the increasing significance of Human Centric Lighting (HCL). This involves, inter alia, the effects of light on people and on their health, per formance capability and well-being. As in the case of HCL, digitalisation is also the key to street-lighting management and is the prerequisite for a variety of other ser vices, such as charging points for e -mobility, W-LAN infrastructure, sensor technology for sur veillance, loudspeakers for emergency announcements and emergency-call buttons. Enriched with supplementar y functions of this k ind, street lighting offers interesting smar t-city lighting concepts and is an impor tant factor for the creation of smar t cities. programme, the coming four-day forum for topical questions relating to the interlink age of safety and security systems in the field of building-ser vices technology is the venue for lectures by exper ts from home and abroad on fire -alarm technology and fire protection, access control and monitoring technology and IT and cyber security, as well as two industr y dialogues for planners and installers and for operators, facility managers and manufacturers. Intersec Forum will be located in the hear t of Light + Building and take place from 19 to 22 March 2018. The new concentration of products for house and building automation together with powercontrolled safety and security technology in Hall 9.1 and the associated special exhibition will create a focal point giving both trade fair visitors and conference par ticipants a complete over view of the entire spectrum of house and building-automation technology and electrical safety and security technology. Background Information On Luminale With around 200,000 visitors, Luminale ranks among the biggest events in Frankfur t and the Rhine -Main region. The festival of light is held concurrently with the international Light + Building trade fair ever y two years. Messe Frankfur t founded Luminale in 2002 and has promoted and suppor ted the festival extensively since then. Next year, from 18 to 23 March, Luminale will have a new concept. Frankfur t and Offenbach will not only be the settings for lighting ar t but also the focus of the festival. Luminale is being positioned as the BIENNALE FOR LIGHTING ART AND URBAN DESIGN with the aim of generating impulses for the city as attractive, future -oriented location and creative hub at the inter face of ar t, technology and urbanity. Background Information On Messe Frankfur t Messe Frankfur t is the world’s largest trade fair, congress and event organiser with its own exhibition grounds. With over 2,300 employees at some 30 locations, the company generates annual sales of around €647 million. Thanks to its far-reaching ties with the relevant sectors and to its international sales network, the Group looks after the business interests of its customers effectively. A comprehensive range of ser vices – both onsite and online – ensures that customers worldwide enjoy consistently high quality and flexibility when planning, organising and running their events. The wide range of ser vices includes renting exhibition grounds, trade fair construction and marketing, personnel and food ser vices. With its headquar ters in Frankfur t am Main, the company is owned by the City of Frankfur t (60 percent) and the State of Hesse (40 percent). For more information, visit www.messefrankfur t.com. ASEAN’s Leading Trade Fair on Lighting Technology, Design and Solutions Thailand Lighting Fair 2017, a trusted platform among industr y exper ts, is heating up the industr y with its ambitious to become a per fect network ing platform and marketplace for Southeast Asia. With thousands of latest lighting technologies on display from upstream ser vices to downstream supplies, the show attracts thousands of ASEAN buyers and offers unrivalled business oppor tunities for international sellers to capture ASEAN’s growing lighting industr y and rising needs for energy efficiency. As ASEAN’s one -stop sourcing marketplace for lighting technology, design, solutions which connects leading lighting manufacturers and distributors from all over the world with potential buyers plus the fair is an excellent educational platform that guide absolute alternative solutions and necessar y up-to-date information for the players in the industr y. A wide array of innovative lighting technologies will be made available at the trade show, presented by more than 350 leading lighting companies from around the globe, tak ing over 15,000 square metres of exhibition space enabling it to ser ve over 15,000 trade visitors across the region. This year! Provincial Electricity Authority (PEA) in collaboration with Messe Frankfur t and The Exhibiz launch “building zone” – to follow light + building show theme and will be organised in concurrent with Secutech Thailand 2017 under the main theme of “Smar t City. Safe City.”. Together, the shows will cover ranges of technologies and solutions from upstream ser vices to downstream supplies needed for the Digital Era development from lighting, electrical engineering & building automation to security under one roof offering promising benefits for lighting manufacturers, distributors and visitors. For more information, visit www.thailandlightingfair.com. shoes seem to float on the raw walls of brick and concrete. Glass and mirror sculptures present the merchandise from unprecedented angles and modify their traditional perceptions. Sid Lee designed an exclusive pattern for the concept as entry and archway, inspired by the interlocking of both brands. The space also introduced special interactive mirror boxes designed by artist Jordan Sodenberg Mills whose work can typically be seen in galleries around the world (Victoria and Albert Museum, Blythe House, Museo Nacional de Bellas Artes), but never before in a retail space. “We really wanted this concept to be special for fans and especially limited edition fans that have seen it all. We asked CNCPTS, what have you never seen before that would blow your mind?! They said, “if we could somehow make the shoes float!”. So, guess what?! We made the shoes float! In a concept like SANCTUARY, what’s more appropriate than that? !” says, Elana Gorbatyuk, SVP Strategy, and Partner at Sid Lee. The space also introduced special interactive mirror boxes designed by artist, Jordan Sodenberg Mills who’s work can typically be seen in galleries around the world (Victoria and Albert Museum, Blythe House, Museo Nacional de Bellas Artes), but never before in a retail space. About Sid Lee & Sid Lee Architecture Sid Lee is a leading creative agency with 600 professionals working globally out of offices in Montreal, Toronto, Paris, and LA. Its multidisciplinary teams leverage the power of radical collaboration to build brands for the modern age, activating communication platforms to engage with today’s consumers across all possible touchpoints. Rooted in strategic thinking, our work ranges from advertising to branded content, digital solutions, design & branding, architecture & retail design, social media, experiential platforms & activations, and analytics. By breaking boundaries to create what matters, our company has earned a global reputation as a toptier brand builder for some of the most progressive clients in the industry. Sid Lee is also at the origin of C2 Montreal, one of the largest innovation events in the world, and is part of kyu, a new collective of creative companies established by Hakuhodo DY Holdings, the second-largest agency network in Asia. For more information, visit www.sidleearchitecture.com. millimetre precision, these geospheres were given a creamy pearlescent finish and positioned on golden spacers. These tapered pillars had the effect of both magnifying the space and making it more intimate, as well as giving guests an unobstructed view of the bride and the entertainment from every vantage point, while encouraging them to move freely and mingle together throughout the evening. Leading into the main space was an entrance lounge where the Korean artist Jee Young Lee had created an installation called specially commissioned by DLE, which set the tone for the evening. DLE’s creative team chose a colour scheme of peachy pinks, creams, soft greys and touches of semi-matte gold, all precisely graduated from light to dark. Applied consistently from the largest surfaces to the smallest details, the toneon-tone palette created an almost ethereal ambience – richly glamorous yet subtle enough to enhance, but not overshadow the presence of the bride. DLE’s attention to detail also extended behind the scenes, with all of the services housed in a series of satellite structures positioned to optimise traffic flow and service delivery. Although hidden from guests’ view by tall hedges, they took the form of geodesic domes to echo the roof-line of the main structure. About DLE Founded by Moutassem Elbaba, Hibah Albakree and Marwan Maaloof, Designlab Experience designs and produces large-scale events for both private and commercial clients. Its ability to marry artistry, technology and refined craftsmanship on a grand scale has cemented its reputation as the region’s pre-eminent production designer and show director. With an architecture-led approach, DLE designs each event from the ground up, custom building every element, from the structural components and lighting to the smallest decorative details, as well as developing and integrating tailor-made entertainment programmes. With offices in Dubai and Beirut, DLE’s in-house team of architects and designers draws on a global network of trusted collaborators and specialist suppliers, ensuring timely and faultless installation of the most complex projects in the Middle East and beyond. For more information, visit www.designlabexperience.com. Honourable Mention. Prof. Dr. Peter Zec, initiator and CEO of Red Dot, and Mr. Ken Koo, President of Red Dot, Asia, gave out the awards at the awarding ceremony in Singapore. The Red Dot jury nominated three concepts from the 43 Red Dot: Best of the Best laureates for the Red Dot: Luminary. Major themes were revisited referencing how dissemination of information and crowd sourcing can be more efficient through an interactive communication system; the future of user experiences in autonomous driving with the creation of an automobile sculpture that shows new ways of interaction between driver, passenger and vehicle; and the future of personal travel devices aimed at solving “the last mile” problem of urban daily commute. Consequently, ”Blood SOS” by Kim Euimin, Kim Heejung, Lee Wonjin from South Korea, “BMW i Inside Future” by BMW Group Designworks from the United States and “Halo City” by Beijing Onemile Technology from China were nominated respectively for the highest accolade at the Red Dot Award for Design Concept. This year’s Red Dot: Luminary aims to change the way urban citizens explore their cities. “Halo City” is a readyto-launch micro-electric foldable scooter and personal transportation tool which allowing users to travel effortlessly to and from bus or subway stations. “We have seen a lot of ideas in the past few years, but here we seem to experience a next-level-solution“ Red Dot juror Professor Lutz Fügener explains. “Almost all problems resulting from the challenging compromise between usability, simplicity, aesthetics and attractiveness have been solved. This "all-of-a-piece” product surprisingly communicates self-awareness and highest usability in all details - from folding to riding, and all the added useful features.” The Red Dot: Luminary trophy is then presented to Beijing Onemile Technology by Prof. Dr Peter Zec, initiator and CEO of Red Dot and Mr Ken Koo then concluded the ceremony with the presentation of Red Dot Award: Design Concept winners’ exhibition at the Red Dot Design Museum which now overlooks the waterfront promenade of Singapore’s Marina Bay. The result after a year of compiling work, the winning concepts are also presented at the online exhibition at the Red Dot Award: Design Concept website as well as the Red Dot Design Yearbook for Design Concept 2017. The exhibitions and yearbook are traditions of the Red Dot Design Award, providing designers with a reference to the best in design. About the Red Dot Design Award In order to appraise the wide scope of design in a professional manner, the Red Dot Design Award is broken down into the three distinct disciplines: the Red Dot Award: Product Design, Red Dot Award: Communication Design and Red Dot Award: Design Concept. The Red Dot Award is organised by the Design Zentrum Nordrhein Westfalen in Essen, Germany, and is one of the largest design competitions in the world. In 1955, a jury convened for the first time to assess the best designs of the day. The name and brand of the award were developed in the 1990s by Red Dot CEO, Professor Dr. Peter Zec. Since then the soughtafter Red Dot is the revered international seal of outstanding design quality. Further information: www.red-dot.org. About Red Dot Award: Design Concept In 2005, the Red Dot Design Award recognised the need to identify and celebrate new design concept and innovation, the precursor of tomorrow’s great product. Believing a design concept must be evaluated based on its design merit without prejudice, the award created an unprecedented platform that accepts entries from companies to design students. Today, the Red Dot Award for design concept has grown to be the largest and most recognised professional design competition for design concept and prototypes worldwide. About Red Dot Design Museum Singapore The Red Dot Design Museum Singapore opened its doors in November 2005 and is one of the most popular venue in Asia for design works and references. The Red Dot Design Museum Singapore now sits on a glass building located along the waterfront, and is the latest addition to the Marina Bay as a design focal point. For more information, visit www.red-dot.sg. Brisbane, Australia, UAP now spans three continents, with key studios and workshops in New York and Shanghai and worldwide satellite offices in Melbourne, Dubai, Singapore, Shenzhen and Detroit. UAP’s portfolio includes prestigious projects such as Ai Weiwei’s largest city-wide public art exhibition in New York with Public Art Fund, a sculptural staircase developed with Frank Gehry for the UTS Business School in Sydney, the Jürgen Mayer’s installation in Times Square and the lobby at 10 Hudson Yard in New York, Jackalope, a large-scale sculpture by Australian artist Emily Floyd for the Jackalope Hotel in Victoria’s Mornington Peninsula and Nuage (Cloud) Canopy by the Bouroullec Brothers for Miami Design District. For more information, visit www.uapcompany.com. For more information, visit www.pressebox.de. he Divine Bar located on the ground floor of the iconic Park View Square Building (sometimes also referred to as the Gotham building because of its “Batmanesque” design) had been a landmark destination in Singapore for more than 15 years. The double void Wine Tower that featured an “angel” hoisted up to pick up a desired bottle from the tower. However its lavish interiors was starting to look tired and the owners decided to invigorate some new life in the bar with a challenging renovation. Europe and New York. In 2015 the owners decided to breathe new life in the venue, bringing a new spirit to the bar, renaming it the Atlas Bar. All the iconic interiors like the art deco ceilings and features had to remain challenging the designers (interiors and lighting) to rejuvenate the space with 21st century design and technology, whilst maintaining the key iconic features. The space had to be more flexible and cheerful as the existing lighting was dated, sombre with little mood and flexibility, an operational requirement for the new look bar. controlled and programmable lighting adjustable to different moods and event settings. It would allow for localised mood and effect lighting without having to impact on the iconic ceiling. Existing lighting systems in the ceiling (linear lights, pendant lights and down lights around the perimeter would be retrofitted with the latest LED technology, more efficient, and with better optical performances. The existing dimming system was outdated and needed to be replaced with more dynamic and programmable controls, suitable to the latest lighting technologies. To complement the visual balance and create intimacy at seating level, floor and table lamps were introduce in coordination with the interior designerâ&#x20AC;&#x2122;s (Hassell). The bar and wine displays received a total make over with subtly integrated feature lighting Colour Strategy To reinforce the predominant art deco brass finishes the main colour temperature used is a combination of 2700 and 3000K with a high colour rendering quality (>90) and high binning tolerance to assure consistency in the light colours. Lighting Level Strategy The design was developed on a multi-level lighting strategy. The dim ability of the lighting system was therefore of key importance to achieve the various levels needed for day time, sunset, early evening and late evening hours. Distinctive lighting contrast was achieved by focussing lighting on high visual elements like floral and sculptural displays and feature architectural elements like the wine tower, bottle shelves, the bar itself and decorative balcony handrails. The overall result is a one of great visual balance and interest. cover story Architectural Integration And Enhancement From the beginning the concept was to integrate lighting as much as possible into the architecture and focus on the resulting lighting effects. The suspended super structure that houses the lighting has polished brass finish mirrors its iconic feature ceiling and surrounding balcony. By hanging the structure at the same level as the balconies, the structure has become hardly noticeable and looks like it has always been there. Energy And Operational Effectiveness The retro fitting of the lighting into the latest LED technology has brought down the energy consumption with more than 50% (in some places with nearly 90%) compared to the previous existing predominantly fluorescent and incandescent lighting. As an example incandescent downlights of 250W were replaced with high optic quality LED down lights of only 24W and linear fluorescent tubes of 2x35W by one single linear LED of 26W! In addition the lighting control programs allow for another major saving by only using the lights as and when needed, for instance switching off all unnecessary lights near the windows during the day. All lights are of high durable quality reducing maintenance to a minimum. The Implementation Challenges The biggest challenge was the suspended structure, not so much its design and lighting functions comprising a track and remote controlled spot lights, but the structural integrity of the suspension. The feature ceiling could not really be damaged so the only solution was to use four ceiling roses that could be taken out and refitted with the suspension cables. Designing a 7 by 9m structure suspended from four corners required hefty weight bearing beams of certain dimensions. The final design dimension of the I-beams came within 200x300mm, quite a feat. Project Completion The project was completed by April 2017 after a solid 6 months of renovation work and nearly a year of design works and launched with a big party and much media fanfare. Touted as the “the world’s most ambitious gin bar” in Drink Magazine at it’s opening, the reconfigured Gin Tower houses more than 900 different labels! Thanks also to its stunning art-deco interiors it was recently voted 15th best bar in the world and best new bar of 2017 in the worlds 50 Best Bars listing which was announced in October 2017 during an event in London. A great acknowledgement of which KLD was proud to be part of. For more information, visit www.kldesign.co. according to their use. The groundfloor reception area provides direct access to the floors above. The floor on the quay-level provides reception areas, meeting rooms, services and support activities. On the building’s roof, the large terrace extends the reception areas and offers a panoramic view over the city and river. The offices are spread over the floors and enjoy excellent lighting. A gap that stretches from top to bottom separates the building in two and brings natural light to the heart of the building. It widens to form patio spaces on certain floors, creating terraces accessible to visitors. Designed with the aims of efficiency and comfort, the building is both innovative and exemplary in nature. Navigating your way through the building is easy and intuitive, and the emphasis is placed both on the work spaces and community areas. ingwan district is located at Penghu’s Fongguei Peninsula. Surrounded by sea, it is abundant in marine resources and natural wonders. The basaltic landscape, diverse vegetation, and forts remained from the militar y days make Qingwan the per fect place for tourism development. The cactus park helps the preser vation of the basaltic landscape and stresses the place’s militar y background, facilitating the formation of different types of recreations. Setting up leisure activities along the coastline, such as the plan of bike lanes, then intends to broaden the scope of Qingwan’s ecotourism. Moreover, the project’s landscape treatment work better enhance the district’s condition for ecological diversity. Vegetation planting and air purifying also help. The integration of different parts within the district not only improves environmental quality but also creates more recreations. During the process of vegetation adjustment, water conser vation is made possible due to the corresponding relation between low-lying land and highland, boosting Qingwan’s capability of ecological restoration. In detail, the core zone of the project is to control and minimise any damages construction might bring. Outside of the zone, the projects aims to increase ecological diversity by reconnecting to mountains and sea and the areas nearby. Phase 1: preparing the site by sorting out abandoned camp and environmental (not belonging to the design team’s planning scope) Phase 2: constructing including the one for semi-open basalt-based greenhouse, the one for echinocactus grusonii cactus greenhouse and the one for large cactus greenhouse that can be used as a classroom for parent-child handcraft workshops. Phase 3: fine tuning the construction of greenhouses and the landscape along the axis. And, establishing rainwater conser vation basin according to the district’s geography, which will improve the condition of vegetation by the sea. Phase 4: planning artist villages, shaded walkway along the axis, and exhibition room at the entrance. And, preparing the handover details regarding ROT companies that will operate the site in the future. Practice The project, consisting of the cactus park, artists village, and environmental landscape, possesses great sea views that relax people. The parks are mainly greenhouses designed with elements associated with cactuses; its purpose is to conserve cactuses and basaltic landscape. The artists village is located at an old coastal guard site by the sea. The beautiful beach line consisting of reef rocks and fjords make it a per fect place for artists to create work. To revitalize the old buildings at the site and preserve their original looks at the same time, the design used is mainly placement and face-lifting. Environmental landscape is the green belt that connects the traffic flow of various greenhouses and creates the look and feel of a park. The cactus park includes following spaces: •	Big cactus greenhouse: integrated teak in the shape of the cactus wraps around the facade; large-sized windows facilitate ventilation and basaltic masonry retaining walls that feature prism grid fit the local environment. •	Echinocactus grusonii cactus greenhouse: with bended steel as structure and white and transparent pc panels bringing in natural light, the greenhouse resembles the shape of the cactus and has a soft glow. •	Basaltic-based greenhouse: the making of wall and roof is inspired by local masonry retaining walls; the use of integrated teak on the wall and roof softens the overall look. •	Exhibition room: Basaltic masonr y retaining walls with prism grid fit the local environment; tilted roof facilitates the growth of greener y, greeting visitors coming to the park. •	Shed at the entrance: Bringing the structure of masonry retaining walls and greenery to the roof of the shed situated on a slope, making the architecture coexist well with the surrounding landscape. display spaces. The material is comprehensively superimposed as an ubiquitous structural & lighting medium to assemble an array of “Paper Trees” – a series of distinctive, vertically oriented display spaces for the said merchandise to accentuate spatial hegemony within the building envelope, resulting in the “Cardboard Jungle” concept. Visitors are brought on a journey of ascension through this jungle and led into the suspended ‘Paper Tree Houses’ to be surrounded by the unseen beauty of cardboard, elucidating an out-of-this-world walkthrough retail experience tailor-made for a sustainable showroom of the future. and acoustic properties of corrugated cardboard, stacked into vertical columns or “treehouses” for the furniture display. Each “treehouse” can be naturally lit by sunlight in the day and used with ambience lighting at night. This metaphorical jungle, where trees were cut down to produce paper resulting in the by-product of cardboard is “resurrected”, with the full potential of the material’s lighting properties exemplified. For example, to display the effect of shadows, natural lighting is optimised through the strategic utilisation of apertures on all sides of the building parameters to eschew from excessive artificial lighting on the transitor y spaces between the ‘Paper Trees’ which connect the first and second levels - purposefully filtering direct sunlight through the tiny per forations on the humble material, emulating the effect in actual jungles and forests where sunlight that reaches the floor and understor y levels are filtered by a multitude of overhanging canopies. The result is an especial experience crafted by a harmonious assemblage of experimental materials & technologies, bundled in a compact area. About Larry Teo The student designer behind the award-winning concept, Larr y Teo - whom graduated with top honours in 2015 from Temasek Polytechnic Singapore, is currently an architectural intern slated for enrolment into an undergraduate architectural program. A young designer with an expressed interest in avant-garde concepts pertaining to environmental sustainability, some of his other achievements include the Gensler Singapore Scholarship, Pomeroy Studio Prize, Waldmann Lighting academic award and a double-win at the Spatial Design(SPADE) Awards in 2015 & 2016 respectively. In addition to the American Architecture Prize 2017, The Paper Pavilion was also previously shortlisted in the Top 300 out of 11,000 international entries at the IF Design Awards Germany 2016 in the Interior Architecture Categor y, on top of several other accolades in Singapore awarded by the I-DEA Spatial Design Awards and Singapore Design Award 2015.
fter two years of work, Lightemotion, for GSM Project, has added another noteworthy project to its list with the lighting design for Gatineau’s Canadian Museum of Histor y. For Lightemotion’s President, François Roupinian, designing the lighting for this type of museum is an exciting challenge: “ The light should act as a magic wand, directing the viewer ’s attention to key areas.” Through a skillful combination of museum and architectural lighting, Lightemotion has highlighted the work of architect Douglas Cardinal while showcasing the museum’s history. The Project’s Success Is In The Details To accomplish such a feat with a maximum spectrum of effects, the team used over 40 kinds of light fixtures. From theatrical floodlights to gobo projectors and miniature LED heads for subtly illuminating even the smallest details of the displays, all equipment used was carefully studied and adjusted in order to create a unique path of light. According to François Roupinian, “Flexibility is important for creating the right lighting.” Nothing was left to chance, with features including interchangeable lenses, zoom, anti-glare accessories, an integrated potentiometer to adjust the lighting level for conservation needs and ambience, and the option to add colour filters. For this purpose, the lighting manufacturers were chosen with particular care so that a wide range of choices would be available to ensure colour consistency. A Technical Challenge Beyond the myriad of fixtures required, this type of project comes with its own set of challenges! The first is using LED technology to recreate the warmth and subtlety of halogen, as LEDs are often too bright for the more subtle needs of a museum. Another important element to take into account was that certain fragile artifacts are sensitive to heat. When fine-tuning the lighting, Lightemotion worked closely with the museum’s conser vation team to provide consistent and suitable lighting, carrying out tests that included thermal models to ensure optimal conservation conditions for the artifacts. The Dome As The Museum’s Unifying Element The Canadian Museum of Histor y ’s emblematic dome acts as a visual reference point throughout most of the museum pathway. As the dome is an immense structure where it is impossible to install lighting, the team had to use a special approach: “ We wanted to use this constraint as an advantage. That’s where we got the idea to use the dome to create light with indirect lighting. We wanted to make it the centrepiece of the museum’s ecosystem”. After many colour tests, the team was able to create their desired effect: a timeless tone for a comfortable atmosphere where visitors feel as if they have stepped into the museum’s ver y own world. n recent years, private hospitals are increasingly aware of the economical importance of the provincial districts due to the factors that impact the demand of health care ser vices, such as ASEAN integration and the increasing development rate of urbanization. These mentioned factors affect a higher investment in hospitals outside Bangkok, such as leading private hospital Bangkok Hospital. Bangkok Hospital Surat, a full-ser vice medical center, is established under the modern and groundbreaking concept that truly responds to the use of the patients and medical personnel. It was designed with consideration to the architectural design, material selection, convenient and unconfused circulation between departments including the mechanical and electrical system. The lighting system is also from the collaboration with L&E, Lighting and Equipment PCL, for the latest healthcare lighting concept that is tailored for each functional area, with the main objective of providing the appropriate and sustainable lighting. LED innovation has been widely used nowadays. The complexity of the lighting equipment selection suitable for a sensitive area such as hospital or school is the foremost issue that lighting designers and engineers must consider. It has to be cost saving and high quality, as seen in new concepts like Human Centric Lighting, where the light can better improve the quality of life of the patients and medical personnel of the hospital. URA is among Moment Factor y ’s most ambitious and creative illumination projects to date. This 45-minute immersive sound, light and video projection-mapping experience is staged in Montreal’s landmark Notre-Dame Basilica. About the Project •	A total of 21 projectors are used to create the experience, 14 for the show portion and 7 to illuminate the explorator y introduction. •	Approximately 140 lights have been installed throughout the Basilica. •	Four lasers and 20 mirrors are deployed for the laser scene. •	The on-site team is composed of a technical director, a lighting designer, a programmer, an integrator and a systems specialist. •	X-Agora, a specialized projection mapping software developed by Moment Factory, allows the team to create complex 3D maps of the Basilica’s concave sur faces and ornate car vings to smoothly deploy the projection experience. •	The soundtrack was composed by Marc Bell and Gabriel Thibaudeau of TroubleMakers. It features an original orchestral composition interpreted by 30 musicians, 20 chorists and the Basilica’s resonant organ. When James O’Donnell began his plan of the NotreDame Basilica in 1824, he envisioned a magnificent sacred space filled with rich colours and gilded details. The Irish-American architect’s Gothic Revival cathedral is defined by soaring lines and towering spires designed to lift visitors’ hearts and voices into communion with the divine. Almost two hundred years later, these aspirations continue to infuse the Moment Factory team’s approach. Each visitor experiences AURA in a unique way, becoming absorbed in a spectacle in which grandiose architecture, a layer of augmented reality and spatialized orchestral scoring are united beneath the building’s lofty rood screens. Engaging all of the senses, this energy transports visitors through a series of immersive tableaux that take them on an ethereal imaginative journey. Initiated as part of Montreal 375 th anniversary celebrations, AURA was born out of a desire to bring this iconic heritage landmark to life in a new way. The project uses intricate projection-mapping technology to highlight the intricacy and beauty of the Basilica’s majestic architecture and sacred art while framing it as a dynamic part of Montreal’s histor y and spirituality. and elevation. A combination of two-dimensional curved panels gives the overall shape to the full veil. A precise assembly allowed for the per fect control of joints between each panel. On the opposite side of the veil is a one-way mirror wall that conceals twelve newly installed escalators. It creates a reflection that completes the symmetry of the veil and gives the appearance of a widened void. Visitors approach the space through a darkened vestibule leading to the escalators behind the oneway mirror. Between 4th-8th floors, an opening in the one-way mirror wall gives an unobstructed view of the veil. The progression through the spaces gives var ying perspective and moments to experience the everchanging play of light and colour in the void. Acting as the backbone of the main building, it channels the energy to the different retail concepts on each floor and brings part of the buildingâ&#x20AC;&#x2122;s histor y to the present. To negotiate the constraints of the existing building and strict fire regulation, resulted in a space that is symbolic and expressive of ingenuity in architecture and engineering. The entire project was constructed in only eight months while the stores were able to remain in operation. Superb Sports Lighting Solutions of YAHAM Lighting Compact S By YAHAM Optoelectronics Co., Ltd www.yahamlighting.com Designed specifically for large area and sports applications, Compact S series high mast light is exceptionally effective, precise and high-performance, offered with Janus smart lighting control system, to satisfy your clients and earn you a time & labor-saving experience. Benefits - -Extraordinary performance ensured by top configuration - -Great lighting precision and excellent light control, reducing overspill, upward light and glare; - -High weatherproof level (anti UV, corrosion resistance, and SPD available) - -T ime-saving & Labor-saving installation via tool-less adjustable mounting design & unique separable electrical cabinet design. - -Applicable for both televised and nontelevised sports lighting, from large stadia to local sports pitches. Technical Features - -Mounting height 12-45m - -AL 1070 pure aluminum and cold-forging heat sink - -High quality Nichia LED chip - -Integrated PC lens - -Net weight 14.5kg/25.5kg/36kg (2/4/6 modules) - -CCT 4500~5500K (2500~4500K;5500K~6500K optional) Colour RAL 9017 Black For full product details, visit www.yahamlighting.com. Janus Intelligent Lighting Control Janus system is a LED lighting control system based on PLC (Power Line Carrier), whose signal is conveyed by the existing power line, while no additional signal wire or wireless communication devices is needed. Signal and data can be transmitted directly by AC power lines. Light Control Management System Control, switching and dimming of Compact S high mast light can be easily operated by using Janus intelligent lighting control, while energy saving is up to 50%. Meanwhile, with intelligent remote control of Janus system, dimming schedule and real-time light monitoring allows you to save your time, labor and bills. * Based on typical values. * Based on typical values. Subject to change without notice. Boasting a bronze finish, this Chamber energy-efficient LED outdoor hanging light from dweLED by W.A.C offers richness and warmth to any area. The intricate design in the solid casted aluminum build is distinct and eye-catching. The white diffuser lens accents the design, completing the attractive look and feel of this light. • 16" high x 6 1/2" wide. Canopy is 4 3/4" wide x 1/4" high. • Integrated 12 watt LED module; 3000K; 90 CRI; 295 lumens; comparable to a 35 watt incandescent bulb. • Chamber energy-efficient LED outdoor hanging light from dweLED by W.A.C. • Bronze finish; solid casted aluminum construction; white diffuser lens. • Light engine is factory sealed for maximum protection from the elements. • Fixture is slope adaptable. As the best-selling product in 2017, YAHAM Compact Mg series high bay light is upgraded with more competitive price, higher efficiency and more wattages options. •	Multi Watts: 100W/120W/150W/180W/200W/240W •	High Efficiency: up to 150lm/W; •	High Protection Rating: IP65 •	LED Lifespan: >100,100 hours (TM-21 L ) •	CRI: > Ra75 •	Multi Beam Angle: 60°, 90° and 120° optional •	5 Year Warranty •	Perfect for workshop, warehouse, gymnasium, gas station, shopping mall, garage and other lighting purposes. ZEKE is a striking modern semi flush 6 light fitting. The twin wall glass shades feature a spun glass inner layer which really sparkles in the light. Finished in polished chrome with a height of 390mm which is suitable for most modern low ceiling rooms. Inspired by a ﬂower bouquet, DelightFuLL designed Madeleine. Light, gentle and elegant this suspension ﬁxture adds a French touch to any cool commercial establishment. Its structure is handmade in brass and the lampshades in aluminum, it is also possible to have with an adjustable drawbar so that the user can move it anytime. LipReadingCCTV Coming Soon to Supermarkets!